When writing for two harps, one’s first idea could be to use all chromatism that is impossible to achieve with one single instrument. But I like to constrain and concentrate on a single aspect. 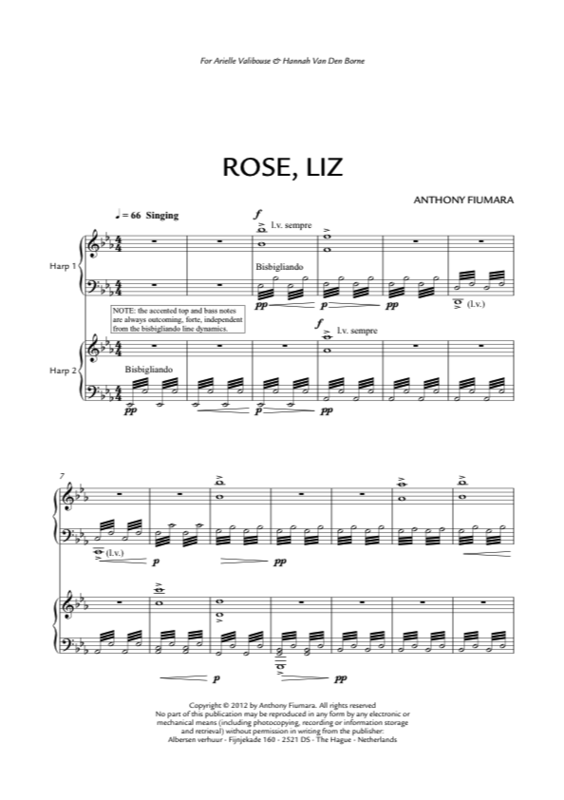 In Rose, Liz that aspect is the vocal polyphony that found a culmination in the music of Guillaume de Machaut. His rondeau Rose, liz, printemps, verdure was the starting point for my piece. I stretched Machaut four-part original in several ways and distributed the voices over the two harps. With their constant tremoli they create a new and nervous vocal tradition — mechanically trembling and fluttering, like the love of which Machaut sings in his rondeau. The result is a field of shimmering harmonies, around which original notes of the melody appear and disappear like poppies. Commissioned by Frank Nuyts, Iris de Blaere and Voorwaarts Maart! / En avant Mars! festival in Ghent. Premiered by Arielle Valibouse and Hannah Van Den Borne, 1 March 2012, in De Bijloke in Ghent.